Most Attractive: They offer really good options for dedicated hosting plans, and offer some competitive shared plans as well. They offer both Linux and Windows platforms for host. 1 & 1 is also one of the largest web hosting companies in the world. Least Attractive: While 1 & 1 offers some competitive plans in relation to pricing, they strip away things that a lot of other web hosts offer. Some examples would be web space, bandwidth, database space, etc. This is only in relation to their shared web hosting. They offer great value for dedicated hosting. To date, 1and1 is one of the most reliable web hosting service providers in the market. With over 10 million strong contact contracts, it’s no surprise that 1and1 is one of the top web hosting service providers in the market. 1and1 is also one of the largest web hosting companies with almost 2400 employees completely dedicated to making 1and1 the best web hosting company. 1and1 ensures that they provide only the best when it comes to the kind of products they provide to their clients by continuously updating their hardware with only the best and latest technology being used today. Aside from this, all their data centers are tested and verified to be one of the safest and highest standards when it comes to performance, connectivity, security, and power. Even if 1and1 is one of the biggest web hosting providers, compared to the other web hosts, they are less popular and need more exposure. 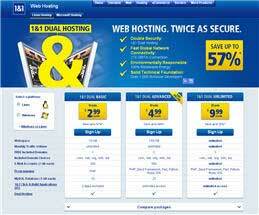 This 1 and 1 hosting review will explain why buying 1 an1 web hosting is worth it. 1 and 1 web hosting offers one of the cheapest and most affordable web hosting services. Even if prices come in cheaper than most web hosting service providers, service and features don’t come cheap. 1 and 1 has one basic plan which has a 12 month billing term and is priced at $3.49 per month. The plan has everything one will need to start up, maintain, and manage their website. Some of the features include five domain names without no additional charge and a shared hosting package. The plan also gives the user 10GB of web space, firewall protected data and daily backup of all the data found on the website. Knowing how affordable it is, it’s quite surprising that 1and1 offers a full refund after the 90 day trial period given to each client. Everyone who has decided to pick 1and1 as their web hosting program is given just 90 days to decide whether this web host so the perfect web host for their website. If 1and1 proves to be unsatisfactory for any reason, clients will get their money back, guaranteed without any questions asked. Being such an affordable web host, 1and1 does not fall short of features needed to manage and maintain a website. When purchasing a plan from 1and1, each client will have a free domain and a free domain registration. One of the best features to be included in the plans of 1and1 is the firewall protected data which is really important so as to minimize any file damage that may happen due to a virus that may destroy it. Daily backup of the website is also provided by 1and1, so clients are ensured that all their data is safe in times of technical problems. Since 1 and 1 is a big web hosting company, their customer support team is built by only the best customer service agents who can be contacted 24 hours, anytime of the day. Customer service agents are willing to help and assist 1and1 clients for queries addressed through their live chat or through their email or their hotline. Many 1and1 hosting reviews have also proven how efficient their customer support team is. For every plan purchased at 1 and 1 hosting, clients are given the website builder application which can help them build and manage their websites. The simple controls are definitely user friendly so any first timer can understand this in an instant. For those who are not that used to technical stuff, the customer support staff are always ready 24 hours of the day to help any 1and1 client who might be confused using the program.